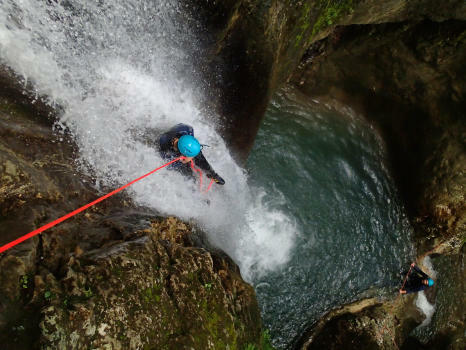 Canyoning vers Grenoble, Les canyon du Vercors et de la Chartreuse. Le canyon de l'Infernet , à seulement 15 minutes de Grenoble! Le plus pratiqué par les Grenoblois, le canyon du Furon haut! Le canyon du Furon, à 10 minutes de Grenoble au dessus de Sassenage. In Grenoble, the mountain is omnipresent. Wherever we can look on the summits. The town nestles in this basin, between Chartreuse, Belledonne and Vercors. The Oisans is not far, and the Trièves either. A few stretches of the city, there are a multitude of outdoor sites, of high quality. Enough to escape every weekend and even more! As for canyoning, the sites easily accessible from Grenoble offer courses of first choice. A summary of what is best in the region. Establishing a limited selection of inescapables canyons among the hundred of descents offered by the surroundings is an exercise subject to debate. The section "To do more" is fortunately made to allow you to discover other equally interesting courses. But to get started, do not hesitate to taste our inescapables selection. A 30 minutes or less from Grenoble, Chartreuse or Vercors, discover these courses, classic and superb, adapted to all. Little brother of the ECOUGES, very close to Grenoble, the VERSOUD canyon is an extraordinary course. 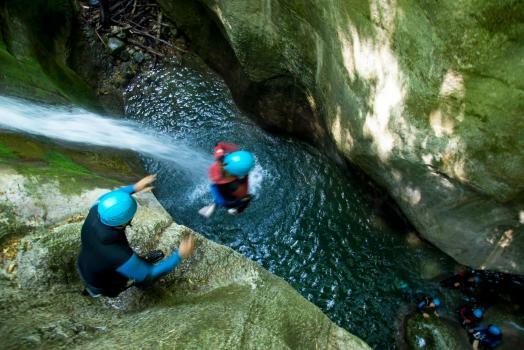 Indeed, how to guess that there, under the cover of verdant trees, hides a magnificent little gorge where the waterfalls, superbly carved in the rock, offer a refreshing trip with reminders, jumps and slides! The Furon upper part is not enough? Then tap on its lower part. Accessible by public transport from Grenoble! A few reminders, secret passages under the blocks and beautiful jumps will allow you to complete a course of almost 6 hours between Engins and Sassenage. Halfway between Grenoble and Valence, the Ecouges canyon thrills at the list's top of the most beautiful courses in Vercors. Its intermediate part is very complete with reminders of 10 to 25 meters, many jumps, slides. All in a beautiful natural setting. A big half day of pure pleasure! The Infernet is a superb trip that will leave you with unforgettable memories. Let yourself be surprised, come and discover this extraordinary place in Quaix-en-Chartreuse only** 25 minutes from Grenoble ! Do you want more ?! A whole day in the water? 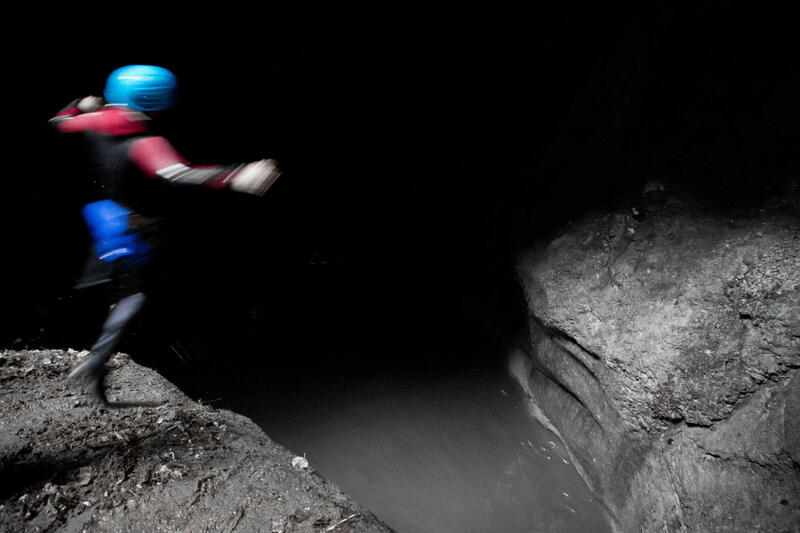 An obscure exploration between canyoning and caving? More reminders? Do not be afraid, there is something to satisfy you. Between Grenoble and Chambery, on the flank Eastern Chartreuse, the Alloix canyon will allow you to chain several boosts watered in a green. Waterfalls of 15 to 45 meters and even a beautiful slide, enough to make beautiful memories of aquatic verticality !! !